Moore created accounts on Match.com, “the sole purpose of which was to connect romantically with other women,” according to his ex-wife’s testimony. 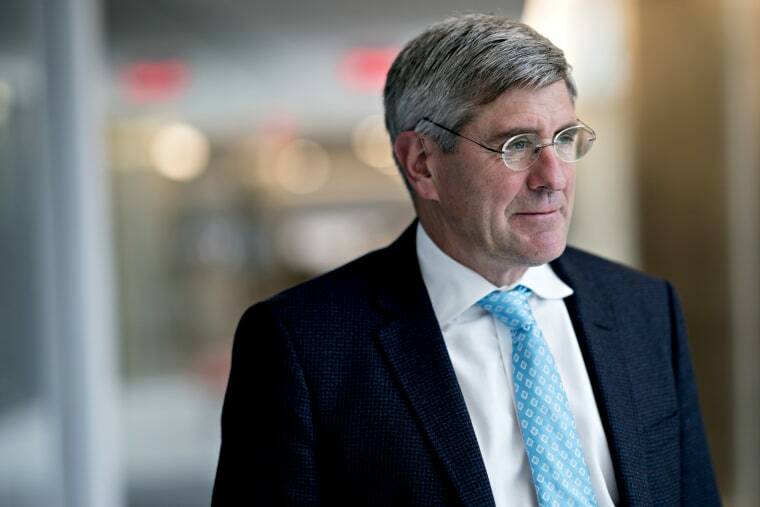 Court records from Stephen Moore’s divorce paint President Donald Trump’s nominee for the Federal Reserve Board as a brazen philanderer who openly talked about his mistress in front of his kids — and then continued shorting his ex-wife on tens of thousands of dollars in alimony and child support even after a judge held him in contempt of court. “I have two women, and what’s really bad is when they fight over you,” Moore said to the couple’s children in front of his former wife, Allison, “at their son’s graduation ceremony,” court records claim. Other court records show Moore, who is a distinguished visiting fellow at the conservative Heritage Foundation, has a $75,000 IRS tax lien against him for unpaid taxes on his 2014 filing. The lien relates to a deduction he took for both alimony and child support to his ex-wife. He has said he is contesting that amount. Despite that and the revelations from the Moores’ divorce, Trump continues to back Moore’s nomination to the Fed, according to a senior White House official who spoke to CNBC. The conduct by Moore, a conservative economist, as alleged by his former wife stands in sharp contrast to his publicly published positions on marriage. But more than three years before that, Moore was not acting like a devoted husband, Allison Moore said in a divorce action filed in August 2010 after two decades of marriage. And then when the couple split, she claimed, he did not pay her — or their three children — what he had agreed to, she said. It was only after a judge’s contempt order, and a threat in that order to have Moore arrested so he could purge that contempt, that he began paying alimony and child support. Trump on March 22 said he would nominate Moore to the Fed’s board of governors, after he read a Wall Street Journal column Moore had co-authored entitled “The Fed is a Threat to Growth.” The column slammed the hike in interest rates by the central bank in the latter half of 2018, which Moore claimed was preventing the economy from maximizing the growth it should be realizing from Trump’s financial policies. Moore, who was an adviser to Trump’s 2016 president campaign and co-wrote the 2018 book “Trumponomics: Inside the America First Plan to Revive Our Economy,” in December had called for Fed Chairman Jerome Powell to resign after the central bank increased interest rates. Moore’s position on interest rates dovetails with that of Trump’s annoyance with Powell and the Fed. While Trump has called Moore a “very respected” economist, not everyone in the economics field is nearly so impressed with him. Greg Mankiw, a conservative who headed the Council of Economic Advisers under President George W. Bush, said in a blog post that Moore lacked the “intellectual gravitas” for the Fed post. After the financial crisis in 2008, Moore had predicted — incorrectly — that low interest rates set by the Fed to encourage a recovery would lead to high inflation. He also assisted with the plan to slash income taxes in Kansas under Gov. Sam Brownback, which resulted in the state’s bond rating being cut and revenue falling hundreds of millions of dollars, the Center on Budget and Policy Priorities noted in May 2017. That was the same year the GOP-controlled state legislature overrode Brownback’s veto and undid his tax cuts. When Trump formally submits Moore’s nomination to the Senate, the Senate Banking Committee will be responsible for reviewing Moore’s nomination and for forwarding it for a vote to the full Senate. The spokeswoman had no comment on the details of Moore’s divorce and financial dispute with his ex-wife. The details surrounding Moore’s divorce, contained in Fairfax County, Virginia, court files, may make his path to confirmation even trickier. The Guardian newspaper first reported Saturday about details of the Moores’ divorce and the fact that a judge in Fairfax County had held Stephen Moore in contempt of court for failing to pay Allison more than $300,000 in alimony, child support and the balance of their divorce settlement. Moore was first found in contempt of a court order by a judge in November 2012. In March 2013, a judge issued another order demanding he purge himself of his contempt by paying Allison what he had agreed to under their settlement. Months later, he avoided a court-ordered sale of his house by paying Allison $217,000 toward his arrearage of more than $333,300. On Monday, The Guardian posted online the case records it used for its original report hours after CNBC broke the news that the file had been sealed to public inspection at Allison’s request. In December 2009, Allison claimed, Stephen Moore created two accounts on the dating web site Match.com, “the sole purpose of which was to connect romantically with other women.” After meeting and dating “at least one other woman” through those accounts, Stephen Moore, “by his own admission, commenced a romantic adulterous relationship with Sherri Wallmark” by February 2010, court records state. Wallmark, in an interview with CNBC, denied knowing Moore “when he was married,” although she did not deny having been in a relationship with him in the past. Allison Moore’s lawyer David Roop declined to comment on Wallmark’s remarks. She said in court records that she had been “a good and dutiful wife” to Stephen, but that she “has suffered emotional and psychological abuse” from him “throughout their marriage.” Allison Moore said in her filing that in the fall of 2009, she “had no other option but to leave the marital home with” the youngest of their three children, then aged 8, “to protect herself from Defendant” and his influence on their two older kids. Her intent, she said, was to give Stephen “space ... to allow him to get help and change his behavior.” At the time, she wrote, she hoped she would be able to reconcile with him. “Since then, [Stephen] has neither altered his behavior towards [Allison] nor ended his adulterous affair,” the complaint said. Allison’s complaint called her the “primary caretaker and role model” for their children. Stephen, on the other hand, “has recently acted indifferent towards their children,” and was providing “little or no supervision” to their two older sons, who were living with him in the marital residence, the complaint said. In a May 2011 filing by Stephen, he wrote that he “admits all the allegations” in Allison’s complaint.